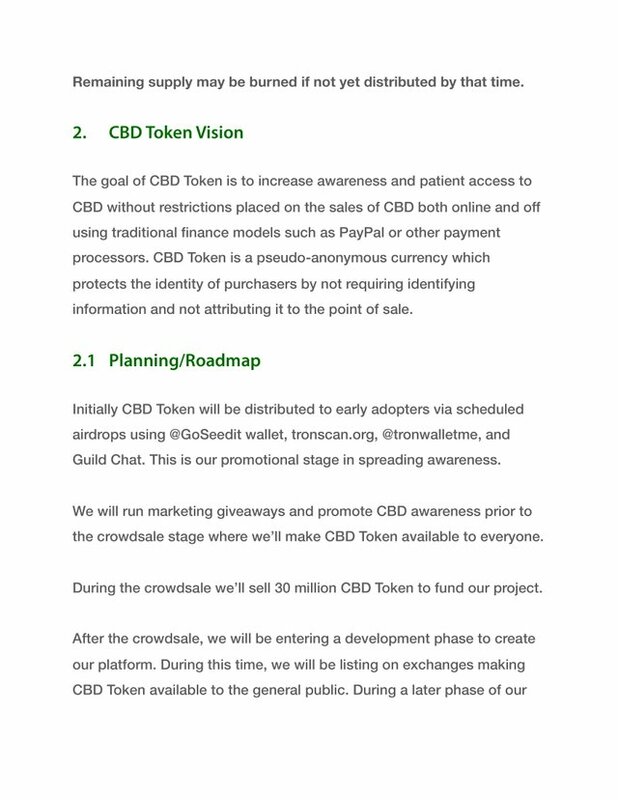 NAME: CBD Token SYMBOL: CBD Our Blockchain solution to CBD Sales, Awareness, and Accessibility make one of nature's most powerful cures available to the masses. 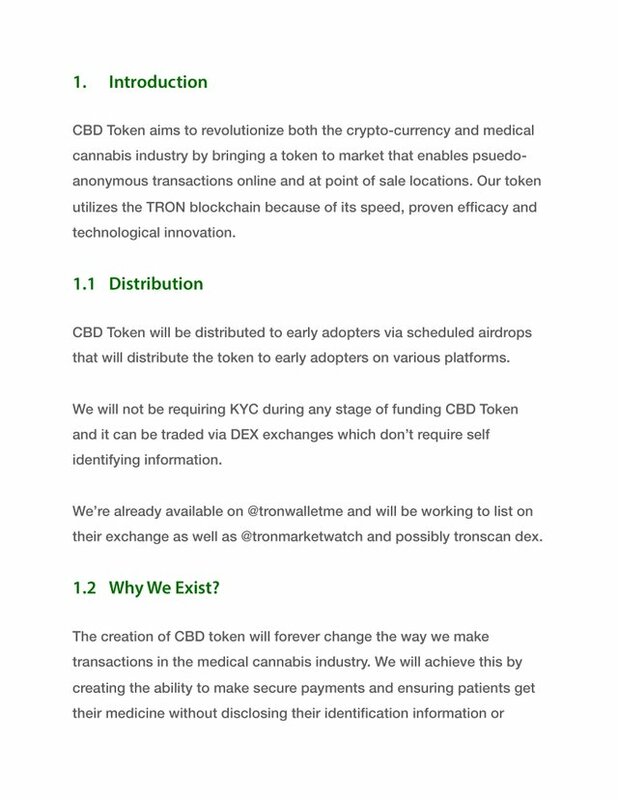 INTRODUCING CBD TOKEN,THE DECENTRALIZED WEB PAYMENT SYSTEM THAT ALLOWS PSUEDO-ANONYMOUS TRANSACTIONS THAT PROTECTS CANNABIS PATIENTS RIGHT TO MEDICINAL CBD PRODUCTS CHANGING THE WAY CBD IS SOLD AND DISTRIBUTED TODAY. As Smoke.Network is a blockchain built for the social networking needs of the cannabis community and the Dapp contains the core social media networking features we thought it would be great to introduce CBD TOKENS on this platform as its the first decentralized cannabis social network and CBD TOKEN falls in the Cannabis community.So Smoke.Network Smokers allow us to introduce CBD TOKEN as We are a crypto-currency start-up token empowered by the decentralized TRON blockchain and we aim to decentralize web payment systems, allowing for psuedo-anonymous transactions, that protect cannabis patients right to medicinal CBD products. 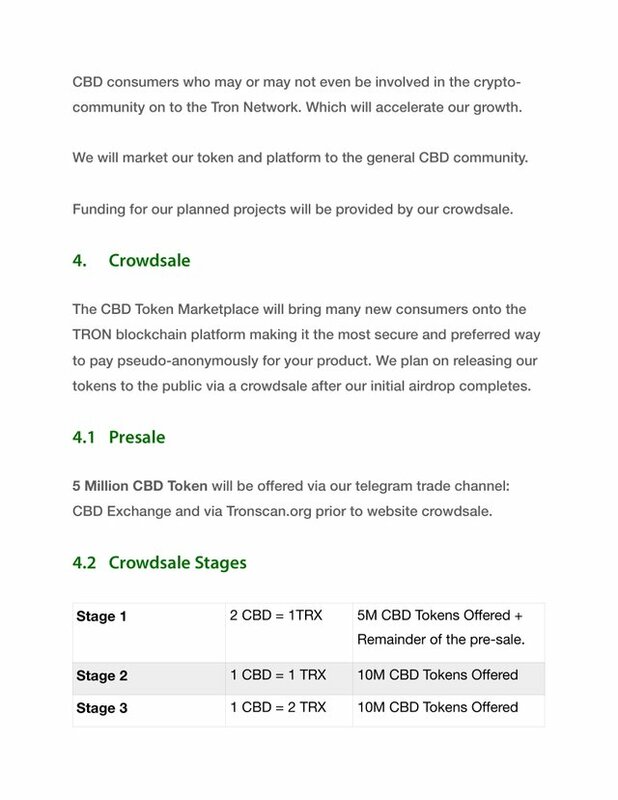 CBD TOKEN is a Token on the TRON Blockchain. A peer to peer payment network with instant confirmations capable of bridging the gap between supply and sustainability in the medical cannabis community. 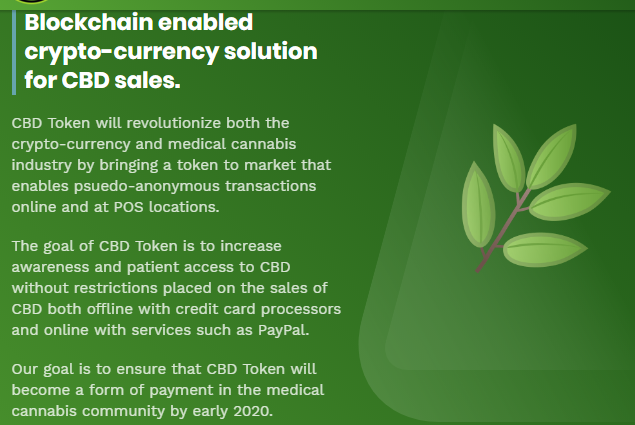 Our solution exceeds the current network payment system which currently imposes restrictions on CBD sales. We're building a CBD Token enabled marketplace releasing in Q1 of 2020 that will completely revolutionize the way CBD is sold online. Restrictions imposed by credit card merchants and PayPal previously prevented such a marketplace. WHERE TO BUY CBD TOKEN?? CBD Token will be offered for sale through our telegram channel in pre-sale, and via crowdsale on our website starting February 12th at 11 AM EST. We will notify email subscribers, twitter followers, telegram and guildchat groups when the airdrop ends and the crowdsale officially begins. 30M Total CBD Tokens available for sale. 5M CBD Tokens will be sold at pre-sale. 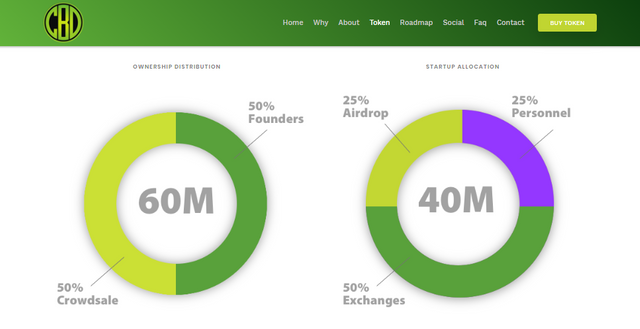 25M CBD Tokens will be sold via crowdsale. Unsold crowdsale tokens will be burned. Because we are part of the TRON Blockchain we have access to innovation that far supersedes current payment solutions. Our integration with Seedit means we can send and receive address based payments as well as accept merchant payments online and in person via the TRON Poppy card program. Smokers community lets all join hands as we create awareness in the cannabis world. So, SMOKE near TRON is a very good idea! I think that you will have success with your project. Good luck in the future! Wow I love CBD and im a holder as it plays a key part and role in the cannabis community as a payment network with instant confirmations capable of bridging the gap between supply and sustainability in the medical cannabis community. Our solution exceeds the current network payment system which currently imposes restrictions on CBD sales. Welcome to the smoke community CBD TOKEN. Lets get some CBD Token and hold the supply is limited. Hopefully they add Smoke Token to the GoSeedit Wallet and we can add to our TRON and CBD Tokens there ... @stoner What do you think ? Every exchange, wallet place to Trade helps. You’re very welcome..... Sharing your posts on Twitter too. SMOKE and TRON together! Awesome! 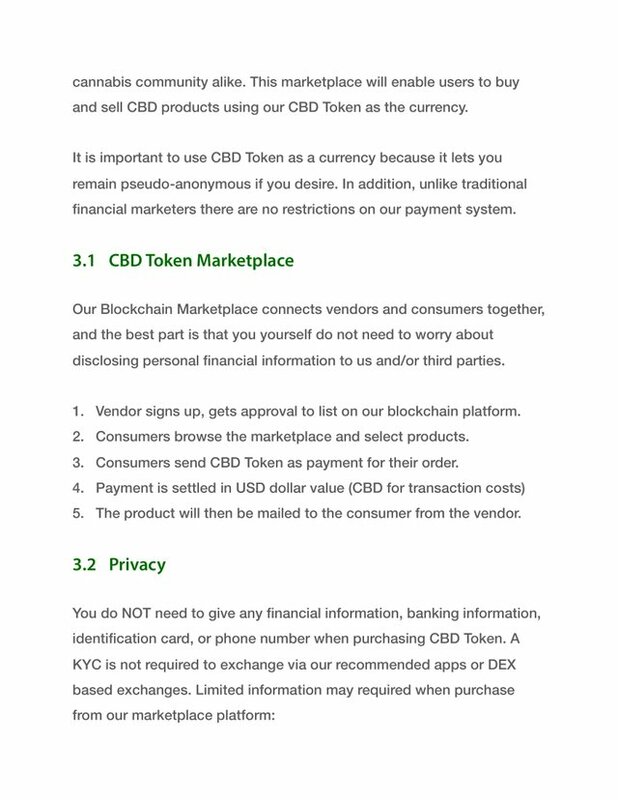 We just promoting our CBDTOKEN on smoke network since we aim to decentralize web payment systems, allowing for psuedo-anonymous transactions, that protect cannabis patients right to medicinal CBD products and it would be good if smokers get to know about us. Well, i am unable to understand why smoke network needs these tokens. I mean smoke is already in the market and how the CBD token will get integrated with the smoke network. But yes, if it can bring something good like anonymity then i would really love to see this integration take place. @a4illusionist The reason we decided to promote on smoke network is that we aim to decentralize web payment systems, allowing for psuedo-anonymous transactions, that protect cannabis patients right to medicinal CBD products. So this just our promotion page of cbdtoken as we in the cannabis business hence we can get support from smokers. Why did you use Tron instead of the Bitshares platform? No need to pay for listings or trading with stable coins is also possible on the DEX. @bench because Since moving to it's mainnet in summer of 2018 Tron has become a top ten crypto-currency by marketcap. With over 100,000,000,000 in supply the network is vast and full of future potential. Imagine a world here major industries are all part of a tokenized economy. Could CBD Token make up for 1:1000th of the TRON market? We believe it's a possibility and we're planning accordingly. Market cap is a measurement of hype factor not technology. Your argument with circulating supply, is complete irrelevant. Your are here only for marketing and don't know anything about technology ? Why should a Merchant adopt TRON Poppy? Why should I buy your Tokens and not Smoke? What is the benefit of your Token compared to other Tokens? We are a crypto-currency start-up token empowered by the decentralized TRON blockchain and we aim to decentralize web payment systems, allowing for psuedo-anonymous transactions, that protect cannabis patients right to medicinal CBD products and because Because we are part of the TRON Blockchain we have access to innovation that far supersedes current payment solutions. Our integration with Seedit means we can send and receive address based payments as well as accept merchant payments online and in person via the TRON Poppy card program. TRON operates on an open distributed public ledger and Your transactions are private and secured by blockchain technology. Hello @cbdtoken, welcome to Smoke Network and thank you for creating your first post!